TANZ hin TANZ her is a participatory dance improvisation and dance creation experience for participants from all backgrounds. 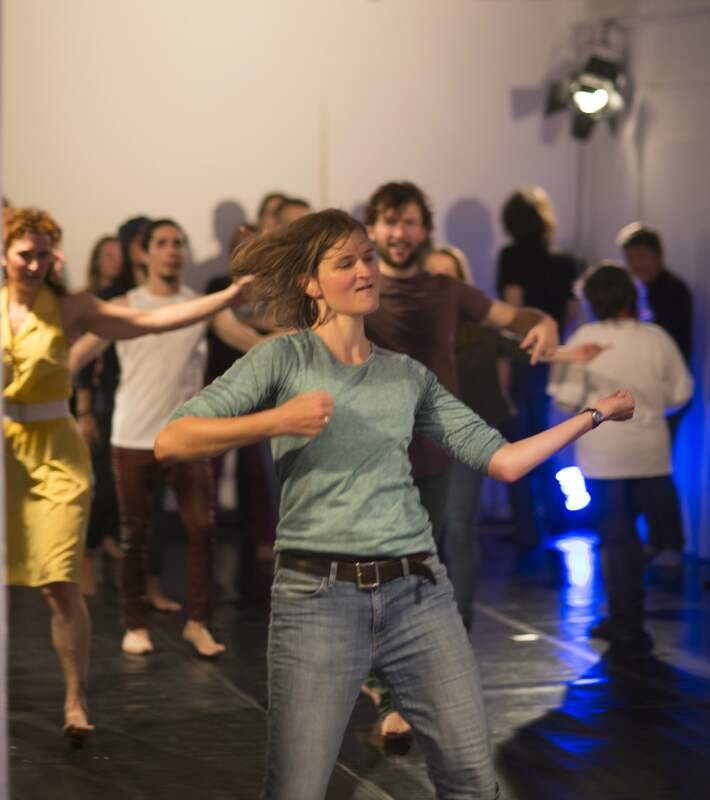 This workshop format has been developed out of the interactive performance “Tanz Hin Tanz Her” which took place at Ballhaus Ost in October 2017, by the choreographer Angela Lamprianidou and her team of dancers Selina Thüring, Irineu Marcovecchio, Maria Ferrara and Ziad Al Hamrawi and Raúl Vargas Torres, which turned the audience into performers. Due to the positive reactions and popular demand TANZ hin TANZ her, they created a recurring workshop format. Angela Lamprianidou offers a structure that enables everyone to follow and invites also every participant to create new movements himself. Starting from gestures the workshop illuminates the idea of integration. What does it mean to integrate into a society or a situation? An empty, undisturbed hall becomes a meeting place. Different stories and people meet and create a collective experience. TANZ hin TANZ her functions as a choreographic placement. Here and there, back and forth, there is nothing wrong nor right, we offer an experience and a different focus on dance creation in the 21st century. Along side a musical playlist dance moves as well as daily gestures naturally merge into a complex choreography. Everybody can dance! This is an invitation to participate in a workshop working on improvisation, duration, rhythm and most importantly for us: the encounter on eye level. After a warm up related to the choreographic landscape of TANZ hin TANZ her, we will start creating small compositions of gestures and bring them into a whole moving picture. Dance functions as a universal language that does not have to be explained. The body speaks for itself. We move from Motown, Soul, Folk, Rock and Roll will never die. Just be open to move your body and to share movement and feelings! TANZ hin TANZ her is a transformative expirience of what dance can transform. The performance will be followed by a communal talk with the choreographer and the performers. Angela Lamprianidou is a Greek, Spanish and German choreographer and performer, who is living and working now in Berlin. She studied choreography and techniques of new interpretations for 4 years at the “Institut del Teatre del Barcelona”, where she was living for 14 years. She recieved various “matriculas de honers” for her artistic works in composition, staging and dance history. She collaborated with theaters such as “Mercat de les Flors “, Antic Teatre, National Theater of Catalunia in Barcelona, Ponec Theater Prag, Ballhaus Ost Berlin, among others. She created pieces at SITZ, Appointment on stage, Tanz hin Tanz her, Back to emotion, el cuerpo del otro, Katharsis etc, and is a national and international teacher of performance and composition. She is teaching in Norway, Greece, Barcelona, India and Germany at the moment. She loves to combine art and health, and works also in the field of energy yoga, and has created her own vision of life: “you are the point”. Life is a dance, we breathe, we dance. In marameo she is presenting the piece TANZ hin TANZ her as a workshop experience, which she elaborated with Selina Thüring, Maria Ferrara and Irineu Marcovhecchio.